I was anxious to get started on the Burda origami hem coat, and the thought of ordering fabric online and waiting a week (or probably more) for it to arrive seemed unbearable. So I decided to treat myself at my local fabric shop. Nancy's Sewing Basket is a favorite among Seattle seamstresses, it's here that you'll find supple Italian wools, silky soft Swiss cottons, and everything in between. My goal was to find a type of fabric and a color that would make the coat wearable in the spring. I spotted a Nicole Miller matelasse - an ivory cotton with gold metallic threads running through it - and it was love at first sight. Before making my final decision, though, I folded some of the fabric to see what the origami would look like; I wanted to make sure the fabric would hold the folds crisply and that multiple layers would not be difficult to manage. It passed the test! I included a swatch of the matelasse with a load of laundry I was running. I ironed it dry and it held up just fine, so I hand-washed the entire yardage before cutting. I let it line dry, but I hurried it along a bit by ironing it using low heat. I decided to underline the fashion fabric with cotton flannel to provide a bit of structure, and minimal warmth too, as the matelasse itself is not very substantial. How convenient that the current issue of Threads (#135, Feb/Mar 2008) has an article by Kenneth King on underlining! 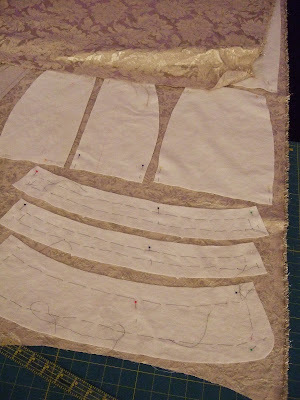 As described in the article, I first cut out the underlining pieces (in the cotton flannel), and I used those as my pattern pieces for cutting out the fashion fabric in a single layer. 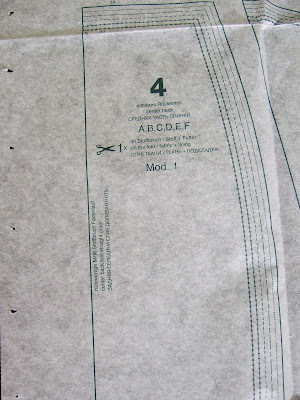 The underlining is basted to the fashion fabric before cutting. 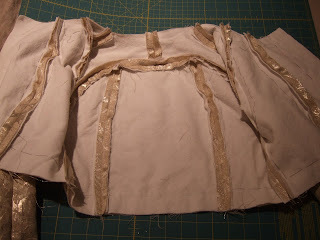 So far I've got the bodice and sleeves of the coat complete. Each seam provides shaping, and the fit is fantastic. As you may know, Burda Easy Fashion is only available in German (it used to be available in English but perhaps it wasn't profitable?). Those of us in the US can order it from GLP News, just like our BWOF subscriptions. Each grouping of coats, blouses, pants, etc, is essentially one pattern with several variations. 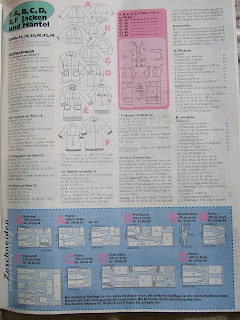 For example, this is the pattern sheet for the jackets & coats; they've all got the same bodice but it is easy to mix and match elements like collars, pockets, etc. 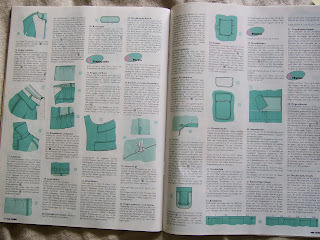 The patterns are printed on a tissue sheet, and the pattern pieces are not overlapping like the regular Burda magazine. Still, I traced the pattern so I can preserve the original sizes. 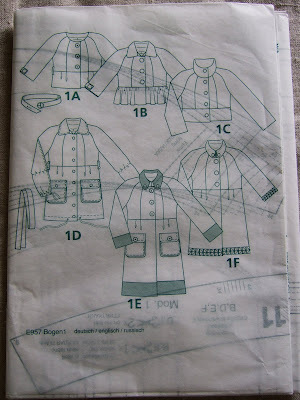 The markings on the pattern sheet are shown in 3 languages: German, English, and Russian. The instructions are entirely in German. If you use BWOF, the format will be familiar to you. Well, except for the pictures! Yes, there are some pictures included to illustrate the construction process. Here, most of the pictures are included with the instructions for the first jacket, 1A, then additional pictures are provided with the instructions for 1B, 1C, 1D, etc, that show details specific to those garments. Love your fabric, that's going to be an awesome coat. Beautiful fabric, it's going to be a gorgeous coat and I can't wait to see it on you! this fabric is divine, what a great choice! Wow, that coat is going to look damn fine! Can't wait to see the final jacket. It's looking great so far! That looks great so far! Love the fabric choice, it's so elegant. And thanks for the info on the underlining article-- my mom and I used to get a subscription to Threads but it just ran out (think I'm going to have to ask for a new one for my birthday or something!) I've been curious about underlining lately, as one of my sewing resolutions this year is to learn how to finish garments better, so I'll definitely have to check that out! I can't wait to see the coat. Are you going to line it? Can't wait to see the final product! It's going to be beautiful!!! 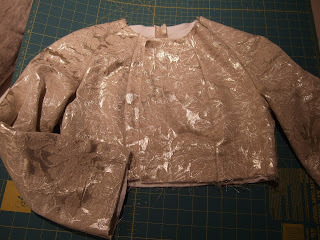 The fabric you have chosen is gorgeous....I just love the metallic brocades that are in the magazines.There was a Moschino coat in one of my magazines very similar in style to yours. Can't wait to see the finished product. Great fabric choice! It will be a gorgeous coat! I'm lucky that Burda Easy Fashion has a Portuguese edition (unlike the regular BWOF that I can find only in French or Spanish). Like you, I prefer preserving the pattern sheet. awesome! I was not aware of burda easy fashion magazine, so of course, I need to get a subscription. I love the concept of using a basic block and using different design details. I never want to sew another garment EXACTLY like the one I've just finished, but I'd surely go back and sew a variation of it. Very darling coat & the fabric you chose will be gorgeous. I love your coat and the fabric choice! It will be beautiful! I have this magazine too but have been chicken to make the coat as my languages are English and French--no German at all! Any tips you can share in figuring out the directions? Christina - did you pretreat the flannel before applying it to your coat fabric? I am sure that you did and I just missed that step! Otherwise I LOVE your fabric choice and really miss the fact that the Burda Easy's no longer come in English. My DD made an entire wardrobe from one magazine a few years ago but now that its only in German she won't go near it! I think its because she's still a beginner and needs the instructions. Beautiful fabric for your Origami Burda coat. Reading about your favourite fabric store "Nancy's Sewing Basket" brings back fond memories from the time I lived in Seattle. It was the store around the corner and my first experience with a USA fabric store. Certainly one of the best fabric and notions stores in Seattle.